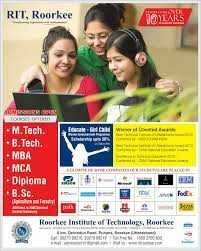 Over the years Roorkee Institute of Technology (RIT) has become a final destination of Technical and Management Education for aspirants of engineering and management. Here, talent meets guidance and is nurtured to the efflorescence for transforming aspirations into reality with an avowed aim of changing its young engineers and management professionals into professionally expert individuals, new generation citizens, thereby imbibing moral-&-ethical values and fervour for social responsibilities . Located in the serene surroundings of Puhana, exhaling an aroma of tranquility and an ambience of peace and composure, RIT instills the feelings of piety and spiritual mooring, which makes the denizens rooted to their grounds of cultural heritage. Its lush green fields spread over 20 acres, with sylvan back drop makes its charm irresistible and bewitching. Established under the aegis of Himalayan Charitable Trust, RIT has stood true to its vision and mission of imparting quality futuristic technical education, instilling high values and fostering growth. Its majestic architecture, panoramic view and world class infrastructure whisper a grand message into the ears of aspirants, who choose RIT as their final destination of engineering and management education. At RIT the latent and potent qualities of students are given proper let out to find fullest growth after chiseling, redirecting and sublimating them to be broad based, result oriented and ambitious professionals ready to face challenges strategically with a global perspective. In RIT pedagogy is bipolar, participative and student centred. Here students are prepared for a balanced synthesis of aptitude and attitude, invoking creativity, hard work and excellence. Today, RIT has achieved a towering position in engineering and management education, not only in India but its fame has reached beyond Indian boundaries and it lures students from Nepal, Bangladesh and Gulf countries into its loving cradle. RIT's mode of imparting education is value based, well synthesized and ambitious. Here students enjoy multi ethnic, multi lingual and multi cultural experiences. This gives them global exposure and makes them a truly world citizen.